Whilst I appreciate the benefits of "tubing" mascaras, they really freak me out when it comes to removal. So, when I was sent DHC's version, Mascara Perfect Pro Double Protection, I passed it onto a friend to try as she had mentioned she was looking for a good waterproof mascara. 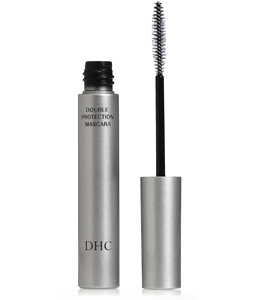 DHC Mascara Perfect Pro Double Protection is a long-wearing mascara which utilises "tubing technology" (i.e. unlike traditional mascaras which "paint" the lashes, tube mascaras create a special polymer "tube" around each lash). This results in no flaking, smearing or smudging. When it comes to removal, you simply splash your face with water and gently pull the tubes off (which freaks me out because it looks as though you are pulling your eyelashes out). My friend regularly uses waterproof mascara but had never come across a "tube" mascara before, so, what did she think? This mascara applied very smoothly and provided good definition, separating my lashes. It didn't really create any volume but then it doesn't claim to. It was waterproof and didn't come off at all while swimming or showering, which is unusual. There were no smudges or clumps. I was very impressed. To remove, you need to pull it off with wet fingers and whilst I liked that I didn't need a separate eye makeup remover, I found that this process took a little while and was a bit of hassle at the end of the day. Apart from that, I had no complaints and will definitely continue to use it, although only on days when I specifically need a waterproof mascara. At £13, DHC Mascara Perfect Pro Double Protection isn't cheap, however, it offers a more affordable alternative to the cult blinc tubing mascara (RRP £18.50).